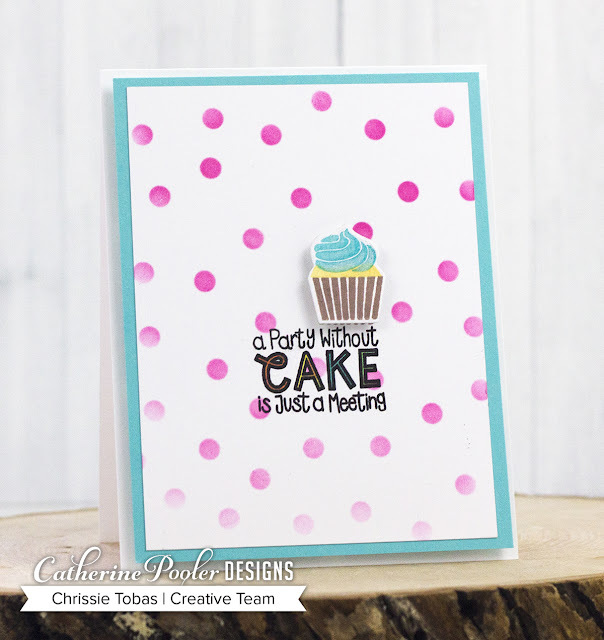 Harvest Moon Papiere: Celebrate Friends Stamp of Approval Blog Hop Day Two! 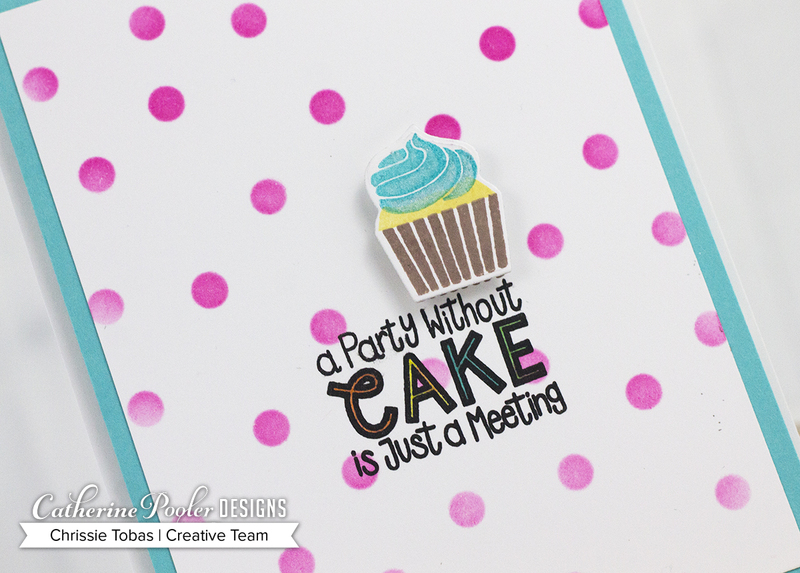 Celebrate Friends Stamp of Approval Blog Hop Day Two! Hi! Welcome to Day Two of the Celebrate Friends Stamp of Approval Blog Hop! You should have arrived here from Karen's blog! We are giving away some gift certificates, so make sure to hop along and comment on each blog to increase your chances of winning! Who doesn't love cupcakes? With the new I Eat Cake stamp set, you can build all kinds of cupcakes and sweet treats. This is perfect for so many occasions! Plus, how great is that Scattered Circles stencil??? On this card, I used I Eat Cake Stamp Set, Scattered Circles Stencil, Party Dress Ink, All That Jazz Ink, Midnight Ink, and Shea Butter Ink. Next, I tried to keep this card very muted. I felt like since it was tea-themed, it should be more refined. I used the new Cuppa Tea stamp set. Did you know there is also a coffee version coming, too?! I can't decide which set is cuter! I created the ruffles using the Lace Border die. I used Cuppa Tea Stamp Set, Lace Border Die, Peppermint Scrub Ink, Black Jack Ink, and Sand Dunes Cardstock in this card. Finally, my last card for today, I wanted like a party! I used the Woo Hoo stamp set and the Celebrate die. The Woo Hoo set is fabulous; there are sooo many different sentiments and images on it. I stamped the confetti over and over again in different inks to make it look like it was falling from the ceiling! For this card, I used the Woo Hoo Stamp Set, Celebrate Die, It's A Girl Ink, All That Jazz Ink, Lime Rickey Ink, and Party Dress Ink. Next up is the amazing Melissa Miller! GOOD LUCK and make sure to hop around tomorrow, too! All supplies linked above and available in Catherine Pooler's Store! Great cards! I really like how you overlaid the lace boarder die. Thanks for sharing. These are fun cards! I'm loving what you did with the layers of the border dies...looks like lace! Really liked use of border dies and confetti. Cheerful cards. Love the sentiment on the 1st one ... how true! All of your cards are cute & pretty. I love all the polka dots!! The tea card is so elegant! Thank you for the inspiration. Gorgeous cards Chrissie, love that stencil! Love the cards! Each one so different but fun!! Beautiful cards! I am loving the lace border die! The use of the boarder die is wonderful! I have to look through my dies to see if I have anything that might work similar to that. I love the hop! The sentiment on your first card is my favorite! So cute. And I like how you layered the border dies on the tea card. Cute cards. I am loving that scattered circles stencil. Thanks for sharing! Fun cards! I love the background of scattered circles. My favorite is the first card - simple, but happy! Love that scattered dots stencil & that confetti stamp. Seriously two great elements in a box of goodness. Great cards. I love the celebrate card, so cute. I wish I had the Party without cake is just a meeting now. My granddaughter insisted on coming to a Tastefully simple party when she was about four and was so disappointed there was not cake. She said then this is not a party it;s just a bunch of people spending money, she'll be 15 Wednesday and has never lived that down. Aw, what a cutie! She's right though; it's not a party without cake (or cupcakes)!!! Wonderful cards! Sweet, lovely and fun - something for everyone. Adorable and super sweet cards. I love them all. Awesome cards! So many different cards coming from one collection! Beautiful cards!! This collection is amazing!! Beautiful cards! I could so see using the first one as an invitation. Great cards and colors! Love the layered edge dies. Great job!! I really like how you used the lace die and layered it. It could be trim on a tablecloth under the cake stand...hmm...I’ll have to try it! So many possibilities! I love how you layered the border dies in the second card. Lovely card ideas! Love the ink colors you used too.. so pretty. Definitely need to check out those inks. Loving this SOA box! Wonderful job with all three of these cards. They are all so different, yet are all fabulous. The colors on the celebrate card are awesome. Awesome cards! I especially love the tea one. I’ve been especially drawn to that craft color lately. I love your cards. The colors on the first card are great. So much fun. Great cards and inspiration. I love the lace die. Sweet cards. Thank you for the inspiration. Your cards are very bright and cheerful, love this SOA collection can't wait until Monday night. Fun cards and perfect for almost anyone! These are fun. I love your polka dot background you did with the die. Simple and sweet! Lovely cards!! I love how you layered the die cuts - I always learn something from these blog hops! Great cards, Chrissie. I love the festiveness of this set. Friends should be celebbrated! I love your use of media on the Tea set card. Very clever. I really like the polka dot “celebrate” Card. Thanks for sharing! What fun cards! I am so loving all the dots. Love your cards! Especially the lace! Cute cards! Cupcakes are my favorite! I love the lacey ruffles and the fade effect on the celebrate die! Such fun designs. Love the dots!! Love the colors!! 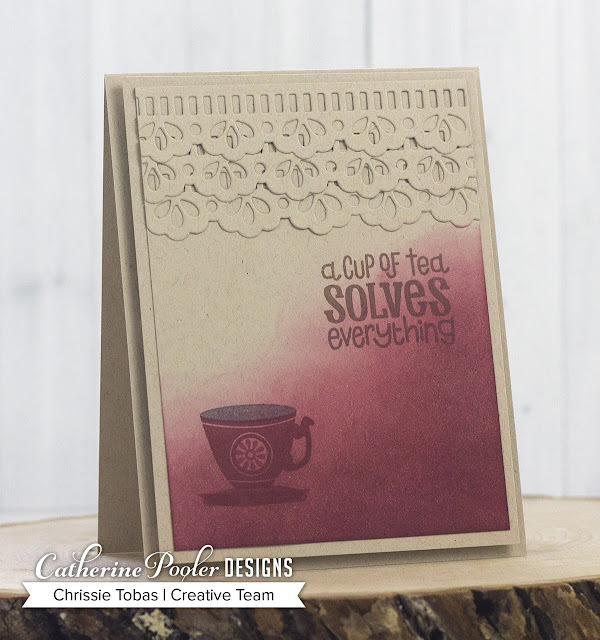 So pretty and fun - love the cuppa tea card with the lacy die cuts. I can’t decide which card is my favorite. I love how you used the border die. Awesome cards! Love the cupcake and cake images! Great collection! Wonderful cards, thanks for sharing your talents. Great cards. Love how you used the border dies. I think I am most excited about these dies but so glad I don't have to choose just one thing from the set. wow! I love the sense of celebration these cards convey. These cards are great. Did you use colored pencil for the inner line of the CAKE? I can't figure that one out. Your cards are marvelous! Love the verse with the cupcake. Love the new border die cuts, what a fun way to use them! Thank you! Marvelous cards, they are awesome. Can't celebrate with friends without cupcakes to go with coffee or tea. Thanks for sharing your beautiful work. Got to love SOA blog hop for a chance to win. I just love how you go from lighter to darker. What a cool look! Sweet cards. Love the look of the layered border dies. Bright descending dottiness and lovely layered lace...beautiful cards! What fun these cards are! I love them! I'm loving your cards! My favorite so far! I love your cards. Very creative to use the Lace Border Die to create ruffles on your Cup of Tea card. The colors and blending on Kraft cardstock make a very striking card. That lace border really does add to the card! Beautiful cards, love the border. Confetti and cake so much fun. I love how you used the lace border die to create the ruffle border. Your cards are awesome! Thanks for the inspiration. Your top card is so cute, like a kid's birthday party, your 2nd card is eye-catching, (love the way you've used the border die) and your last card looks like a great party! Love them! That confetti!! I'm in love with it - can't wait to get my hands on it! Thanks for sharing! Your cards are so cute, Chrissie! Love them!! I love the border bie to look like lace? These are such fun cards, Chrissie! Those cupcakes are so adorable! What cute cards. I really like the dot stencil and the confetti border! Bright and fun backgrounds and great layered borders, great cards! Love the border die. It looks like lace. Very pretty! Also love the circle stencil and the colors you used! Great news of the products in this release. I really like the sentiments especially on the first card. Festive cards with the polka dots and love the lace border on the tea cup card. I a a tea lover. Love that sentiment on the first card! Thank you for sharing your wonderful cards! You’re giving me some great ideas! Fabulous card designs! I love those sentiments! Wow. These are great. I especially love the muted color and border on the cuppa tea card. So pretty! Such cute cards! I especially like the one on the Sand Dunes paper, great colors on that one and beautiful colors on all of them! They are super adorable! Love your designs and the choice of colors. Love the designs, most especially the dots! I really like your cards...the polka dot one is my fav! Cute cards Chrissie! Love the colours in the final one! Seeing dots before my eyes! 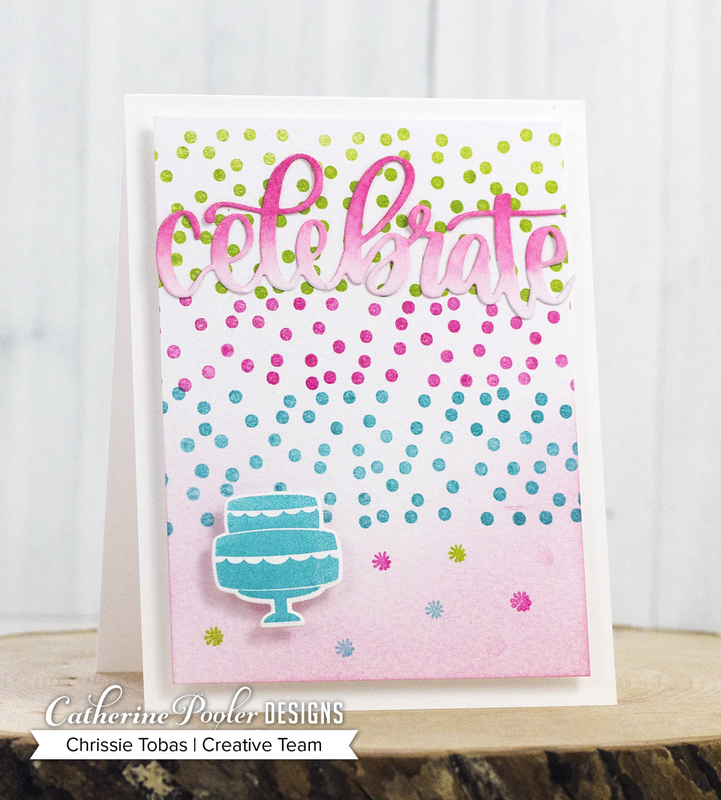 Confetti border and scattered circle stencil are just wonderfully used in your cards. Very creative and I love your color choices! Thanks for sharing with us!! Your stamped backgrounds turn out beautifully! Super cool cards!!!!! Really like the scattered circles! Wow! Your cards are fantastic! I was not really interested in this SOA, and then I started to read the blog hop. Looks like I know how I will be spending my birthday money. These are all wonderful...loving the polkas! In love with your cards - especially the tea cup one! Loving the background stamp, beautiful colours Chrissie. Always disappointed when there's no cake at meetings, until it arrives at the end and then it is party time! These are all too cute! Love the colors! Love the tea cup card. A great use for the lace boarder die. Love polka dots and ombre - never thought about combining them! Awesomeness! Woo hoo, amazing creations! Love them! Such bright & fun cards! Love those polka dots! Ooh, the color blend of Peppermint Scrub and Black Jack is so dramatic. I'm gonna have to remember that one. Ooo, I love how the Peppermint Scrub ink looks on the kraft, especially with the stacked lacy dies. And the other cards are such fun parties on a card. I like how you filled in the cake with matching colors to finish the sentiment. It's really effective! Thanks for sharing. Love all your cards! Really love the border dies. TFS!! Oooo I just love these. They're all so different. Fabulous cards. I really like how you layered the borders on your second card. I can’t wait for the polka dot stencil!! Love it with the cupcakes!! These cards make me want some afternoon tea or coffee and sweet treats! Love the cards! Each one so different. Love them all. These are some great cards, I think that confetti stamp is going to get used alot! I like how you layered the border die cuts. Adorable cards. I think that confetti stamp is going to be a favorite! Cup of tea card is Beautiful! Love the layered border at the top. Great cards.The reasons is elegant. Love the confetti. The first sentiment, a party without cake is just a meeting, is perfect. I love it. Great cards. Love your designs. Love the pink polka dots with hand-coloured "cake" and the confetti card, too. Thanks for the inspiration! Three very different cards and I like them all!